This is Part 2 of an occasional series on the links between fly fishing and neuroscience. Read Part 1 here. We can be our own worst enemies. We can regret prior decisions or worry about the future almost without pause. It is all normal and is based on neuroscience. But, none of that seals our fate, as fly fishing can really help. Let me explain. But, like anything in life, there is too much of a good thing. Specifically, in our brains, the culprit is the Default Mode Network. That is the part at which our minds wander, as we dwell on the past or worry about the future. Why is this important? A wandering mind full of near-constant worry is the best predictor of unhappiness. A mind that is “lost in the moment” and “present” is the biggest predictor of happiness (an interesting podcast on that here). Fortunately, fly fishing and “flow” are there for us. You’ve experienced it on a river. It is a gorgeous summer day, bugs are popping, and the trout are rising to dries. Time almost stand stills. You cast over and over, watching the dry fly intently and eagerly. Later, you’re surprised that the six-hour outing felt like one hour. You didn’t need to eat or drink. You forgot yourself, and it was just you and the river and the fish. You were truly present. This phenomenon, called “flow,” is a key driver of happiness. 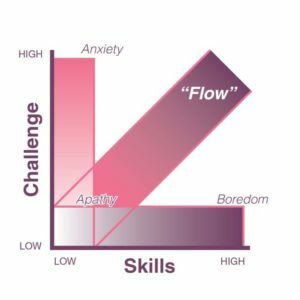 When you’re in the flow, you forget your problems, and your Default Mode Network is on vacation. Fly fishing requires serious concentration because, as we all know, it requires mastery over many things: reading water, fly selection, knots, casting and landing. Go fish. It truly is good for your brain. And, if you’re interested in learning more about what creates happiness, there are some great TED Radio Hour podcasts here. Last, here is a video from Super Bowl 53 The crowd was comprised mostly of Patriots fans. The stadium erupted when the team entered, and it was a tense but very gratifying game in the end.